Participants to the conference were Assoc. Prof. Dr. Nguyen Khac Hoan - Director of HU Department of Science, Technology and Environment, Assoc. Prof. Dr. Hoang Van Hien, Rector of HU College of Sciences, Mr. Ho Trong Cau, Vice Chairman of Phu Loc District People’s Committee, Thua Thien Hue Province and heads of affiliate units, researchers and students. VLIR - IUC HUE lasting for 6 years (2013-2018), funded by Belgium government, aims to empower Hue University to develop in all aspects - university governance, research and training. VLIR-IUC HUE program includes 4 projects, of which Project 3 with the theme "Preservation of the coastal ecosystems and natural resources under the effects of development activities and climate change" is coordinated and implemented by HU College of Sciences. 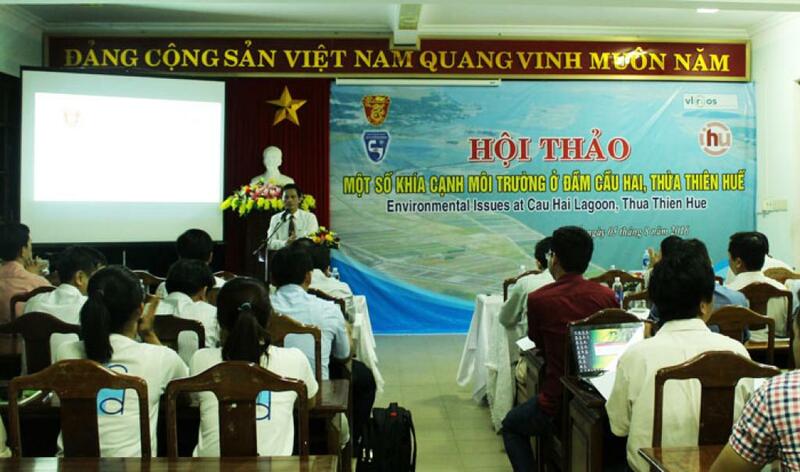 The Project 3 includes training and research of environment and ecosystem at Cau Hai Lagoon in Thua Thien Hue; providing research equipments and laboratory chemicals; short training courses for postgraduate students, graduate students and young faculty; staff exchange and a number of other activities related to the project theme. The workshop aimed to present the project implementation results during the three years 2013-2015 and to facilitate discussion between scientists, managers and local communities related to the project so as to complete the tasks in the next period (2015-2018). The six reports presented at the conference included "Introduction of project 3 activities during the period 2013-2015" by Assoc. Prof. Dr. Nguyen Van Hop - leader of Project 3; "Characteristics of distribution and growth of seaweeds Halophila beccarii Aschers at Cau Hai Lagoon in Thua Thien Hue province” by Phan Thi Thuy Hang – postgraduate student in Project 3; "Nitrogen and phosphorus content of the aquatic weed in correlation with the parameters of water quality and sediment at Cau Hai lagoon, Thua Thien Hue Province" by Dang Thi Nhu Y – postgraduate student in Project 3; "Identification of organochlorine pesticides in water, sediment and some fish species at Cau Hai Lagoon in Thua Thien Hue province" Tran Thi Ai My Y – postgraduate student in Project 3; "Analysis and assessment of concentration of Zn, Cu, Pb, Cd in the water and sediment at Cau Hai Lagoon in Thua Thien Hue" by Dr. Hoang Thai Long – a member of Project 3; and "Application of webgis technology in building database and managing information of natural resources and environment at Cau Hai Lagoon in Thua Thien Hue province" by Dr. Nguyen Quang Tuan – a member of Project 3.